Richmond's MLAs rolled up their sleeves to help out at the Habitat for Humanity home construction site on Ash Street. Nine B.C. 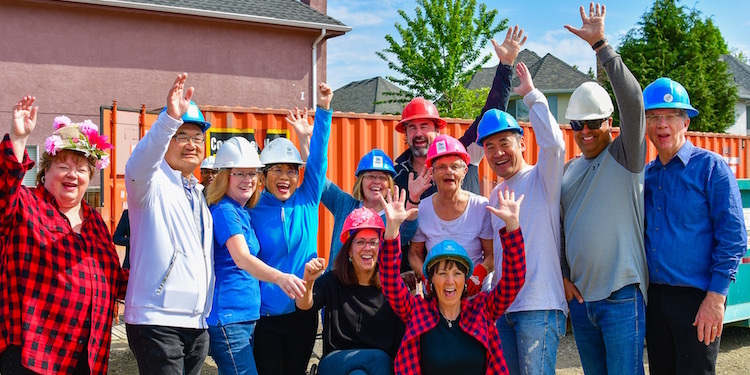 Liberal Members of the Legislative Assembly (MLAs) joined Richmond South Centre MLA Linda Reid to directly help people in their ridings at the Richmond Habitat for Humanity build on Ash Street. Reid has a compelling, personal reason to wield a hammer--albeit in the best-decorated hard hat of the bunch--Caleb Rai, his brother, his sister and his parents. Caleb has Duchesne Muscular Dystrophy, an inherited gradual wasting of physical abilities. He started life as a typical child but as he grew, his abilities withered to where, today, he is in a wheelchair. Life span is often limited for boys with Duchesne Muscular Dystrophy. Through renovictions, the Richmond family has moved close to a dozen times in as many years. Mom Sharon Rai approached Reid, her MLA, to ask for suggestions. Reid took the bull by the horns, finding the forms for Rai to be the one of hundreds who applied to Habitat for Humanity’s Richmond homes. Sharon filled in every detail. The Rais were successful. Taking a page out of her prairie roots, with a belief in practical kindness, Reid donned a hard-hat, plaid shirt and picked up a hammer and set to work, to help the Rai family get closer to their dream of a home of their own that Caleb can roll his wheelchair into and get around in with a bathroom he can use, a shower he can get into. A home with no mold, a home not slated for demolition, a permanent home for the entire family. The MLAs were joined by members of the B.C. Cement Association, each donating a day of their time to help with this important local project. The Rai family has already done 500 volunteer hours to fulfill their requirements so await their move-in date with great anticipation. According to a Habitat for Humanity spokesperson, the goal is to have the Rai family in their new home this fall. There remains a great need for skilled tradespeople who can volunteer to practice their craft on the site so that Caleb and his family can have a safe, accessible home of their home, permanently. For tradespeople who want to volunteer, go to habitatgv.ca/buildteamvolunteer.